One feature in the article is “Bubble Wrap That Never Ends,” by Vanessa Gregory. She writes about the popular Japanese keychain called Mugen Puchi Puchi. It has six small buttons on it, and pressing them simulates popping bubble wrap. The keychain gives the same physical satisfaction as popping the little air bubbles, but the popping fun never ends. It is the perfect portable stress-reliever. 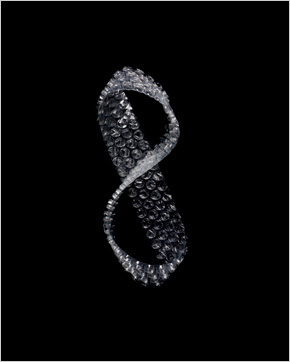 Of course, a Möbius band is one-sided and bubble wrap is two-sided (the bubbles are only on one side). The image is pretty small, but it looks like there are bubbles on both sides of this Möbius band, so the creator had to wrap it twice. In more mathematical language, this is a double-cover of the Möbius strip by a cylinder of bubble wrap! Next Post Is π the right constant?